While we always get a new game at Christmas time, too many of those games have never been played past the holidays and just gathered dust in the game cupboard. In fact, I ended up getting rid of many of those dusty games during my big decluttering project in October. Since then, my quest has been to find games that we will actually play. 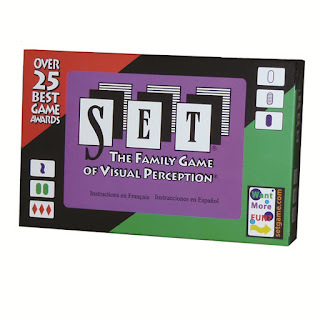 Meaning games that every single person in this family enjoys playing. Otherwise fighting ensues (But I haaaaaate playing Monopoly! Why do we always have to play Monopoly? )(But I don't wanna Boggle! Moooooooooom! She won't play Monopoly with me!). Please tell me that we are not the only ones? Anyway. 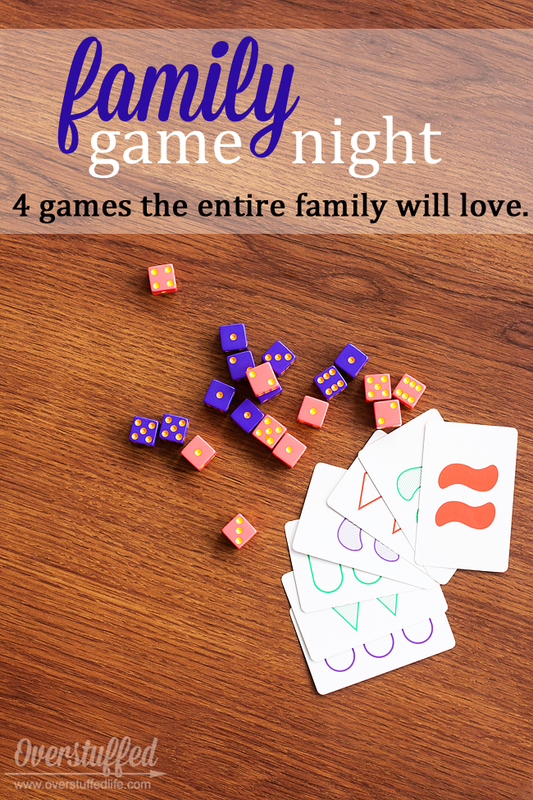 It's imperative that we find games everyone enjoys just to keep the peace during family game night. Or, on Sunday afternoons, which is when we most often play games as a family. And this past year, I've stumbled on a few gems that all three girls AND mom and dad love playing. Tenzi is probably our absolute favorite family game right now. It's easy for kids of all ages to participate and we have crazy fun when we play. Each player has their own set of colored dice and the basic idea is to keep rolling them until all ten dice are the same number. There are lots of variations, which are included in the instructions, and we enjoy all of them. It's a race against chance and everyone is dying to yell "Tenzi!" before anybody else does. The great thing about this game is that even very young kids will be able to play without any problem. You can purchase the dice in four-packs (there are many variations of color--we have two four-packs in two different color schemes), or you can purchase a party pack. My brothers and I decided that this year, instead of just exchanging gift cards (boring! ), we were required to buy something that would make each other laugh. 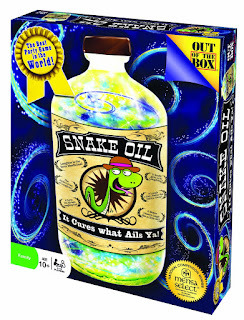 Consequently, I received the board game Snake Oil from my brother Dave. Oh my gosh, this game is a hoot! It's similar to Apples to Apples, but also very different. Each person has to use the words on their cards to come up with a unique product to sell to the customer. The customer is drawn from the deck and could be anything from an astronaut to a couch potato. Now, it is possible that we love this game so much simply because The Maestro is so good at coming up with sales pitches and keeps us laughing the entire time! But I think you'll love it, too. Cover Your Assets is another card game that friends introduced to us. The kids played it first and loved it. The goal is to become the first millionaire by stacking and hiding your asset cards (assets could be gold or silver or houses or jewels or cash, etc.) before anyone can steal them away from you. When you have an amazing card it can be really nerve-wracking while you're trying to hide it! I think the kids have fun trying to call each other's bluff. This one does take a little longer to play, so don't plan on it unless you have time. Set is our newest acquisition. We recently played at a friend's house and we were hooked. Not only is it fun, it really makes you use your brain, which is an aspect I really like. The idea is to find sets of three cards that are either all the same or all different in color, shape, and shading. It takes a minute to get the hang of it, but once you do, you start to really find the many different ways sets can be formed. And I am always impressed at how my youngest daughter (8-year-old Sophia) is able to find combinations that nobody else can find. There is a Set Junior as well, but I think kids as young as 5 will do fine with the regular version. Sunday afternoons and game nights have been a lot more fun lately! What are your family's favorite games? I don't think we've played any of these but I'm going to pick a couple up now. They sound fun! We have been playing strategy games more these days. Settlers of Catan and Civilization are two of our favorites, although Civilization is a multi-day (sometimes multi-week) game!